The Pittsfield Beautification Committee will hold it’s annual Mum Sale Fundraiser, on Saturday, September 8th at the Aranosian Garden, (next to Jack’s Pizza on Catamount Rd. ), from 8:00 am to 12:00 noon. We will be selling a variety of colors in 10” pots and 5 gallon pots. We will also be selling perennial plants for fall planting, baked goods and yard sale items. 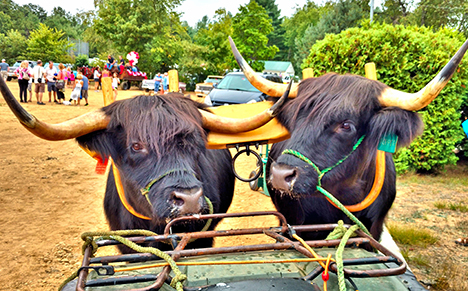 Stash, left, and Topper, right, at the Loudon Old Home Day Parade in 2017. Stash looked at me through his fringe of shaggy hair as I shouted, “Walk on!” He just stood staring at me with a puzzled look on his face. I was standing about 6 feet in front of him and using the voice commands I thought he'd learned. But he was not cooperating. Stash is one of a pair of 6-year-old, black Scottish Highlander oxen. An ox is not a particular species or breed, it's a professional designation, like a plumber or air-traffic controller. For a steer, it sure beats the alternative career path (meat). Stash's partner, Topper, is the same age as Stash, but I've been working with Topper since he was 6 months old. I trained Topper and his original partner, Flash, to work in a yoke. With a chain hooked to the yoke, they would pull logs, a cart, or a sled weighted down with rocks. For two years I took Topper and Flash to county fairs where we sometimes won ribbons in the best-trained competition. Most people are familiar with competitions that determine which team can pull the heaviest load. That one doesn't interest me. We competed in obstacle courses and competitions that tested how well the team responds to the teamster's commands. The teamster has to determine which position works best for each ox, but once they are trained to either the near or off position, it is virtually impossible to change their positions. I once accidentally yoked my team in the wrong positions and it totally bewildered them. Not only do they learn to work as a team but each ox has to learn his name so he can be directed to move forward, back, or to the side independent of the other. Unfortunately at age 3, Flash became unruly. He'd swing his horns when I approached and would run off when I tried to catch him. He was acting more like a wild bull than a well-trained working steer, and I had to make a hard decision. I decided that, with horns out to here, he was too dangerous for ox duty. I had to retire him and find a new partner for Topper. Fortunately, I had a likely match – an untrained black steer with a calm, gentle disposition. Stash (short for Moo-Stash) began his training as a 3-year-old. At first, Stash was terrified of everything – the chain, the yoke, the cart, even the goad-stick. (It's a small stick that reinforces the voice commands, functioning more like a band leader's baton than a whip). But Stash was smart, and by watching well-trained Topper he gradually overcame his fear and, while he isn't as proficient as Topper, he usually stays calm and does what I expect. On Labor Day weekend I plan to bring Topper and Stash to the Hopkinton Fair, so I'm tuning them up and teaching them new commands. It's best to work each ox individually, which is what I was doing that day with Stash. With a little coaxing, he eventually walked toward me and stopped when I shouted, “Whoa!” He'll be OK.
Let me introduce myself. My name is Todd Connor and I am the District 5 Commander for the American Legion. I sadly announce that Peterson-Cram Post 75 is at risk of closing its doors permanently. The reasoning behind this is that the building is in disrepair and there are no officers at this time. My officers and I have temporarily (under new management) taken over. I am in need of a Commander, Adjutant, and Finance Officer. Training will be provided, if needed. This post comes with rich history. Geoff Freese was the first post commander. He served in WWI. Dr. Blood was the first Department Commander from Pittsfield. A meeting will be held on September 3, 2018 at 7 PM at Post 42 Barnstead.The address is 1078 Beauty Hill Rd., Barnstead. If interested, please come to the meeting so we can keep Post 75 alive. Welcome to Our 2018-2019 School Year! Hopefully, all our Pittsfield families have enjoyed a wonderful summer, a summer that is leaving you relaxed and recharged and ready for a great new school year. District staff has been busy preparing for the 2018-2019 school year. All that’s needed now is the positive energy and enthusiasm of our students and the collaboration and support of our students’ families. The start of a new school year comes along with great anticipation and excitement. Whether a student is new to Pittsfield or is a returning veteran of our schools, the opening of school is a special moment for both students and families. Most of us enter the school year with an exhilarated feeling that comes along with a fresh start and a new beginning; it’s a truly energizing point in time. I encourage families to look on the new school year with a spirit of positive anticipation. As our students enter their own school at the end of August, they will feel a strong sense of pride and passion from our faculty and staff, pride in our schools’ history and accomplishments in striving to create a truly student-centered learning environment and passion for the learning and achievement of each and every one of our students. Our teachers and staff are committed to making an important difference in our students lives. Many of our teachers have been working this summer to support our students’ learning through extended year programs and our Summer Academies. Others have devoted a good deal of time to developing our programs, especially through our new work with Universal Design for Learning, an approach to curriculum planning and instruction that is intended to support the learning of all students, regardless of individual strengths and needs. As always, a number of our teachers and staff members have left us and have moved on to other opportunities. We’ll be introducing our new teachers and staff member to you in the weeks ahead, so you are encouraged to keep your eye on our district website and The Sun. We’ll also be describing some key program changes in the weeks ahead, which will be of interest to our Pittsfield families. But now, it’s time to celebrate the beginning of our new school year because this year will be packed with new learning experiences that represent another big step forward toward a wonderful future for all our students. Listed are approximate times that buses will pick up or drop off students. Students should be at the bus stop 5 minutes early. Weather conditions may delay pickup or drop off times.